I watched with great interest the latest video from Stephen Downes, who is facilitating the online E-Learning 3.0, or EL30, as he walked us through the concept of the shift from a Centralized Web (central server, many users) to the Decentralized Web (many servers, many users) to the prospects of the Distributed Web (no servers, many users). I’m still getting my head around it. But as I ponder this move to a more peer-to-peer-powered networking design — where our own computing power become the backbone of networking, through shared resources like CPU and memory and more — I started to think about what this might mean for the issues of access and equity. In other words, right now, there are still many places in the world — some more deeply in need than others — where basic access to the Internet and to mobile and computing devices is difficult, meaning the people — the students, is how I think of it, as a teacher — are in danger of being left behind with learning possibilities, job opportunities and networking options. I say this, though, knowing that people need to have a choice to engage in networking, and I don’t mean to assume everyone should always be doing this. But having no options when you need options … that’s an access and equity issue that has been with us for some time. Not far from where I live, here in a relatively affluent part of the east coast of the United States, there are communities who have long been fighting the state government and the conglomerate cable/Internet providers for digital access, made tricky for sure by the rural and isolated places they live but not insurmountable. The battle, years long now, has centered on the loss of potential for residents in these small towns, and their children’s futures. Meanwhile, where I live, just 3o minutes away from those rural towns, I have high-speed access (as long as I pay for it). Does a shift to a Distributed Web help these situations? 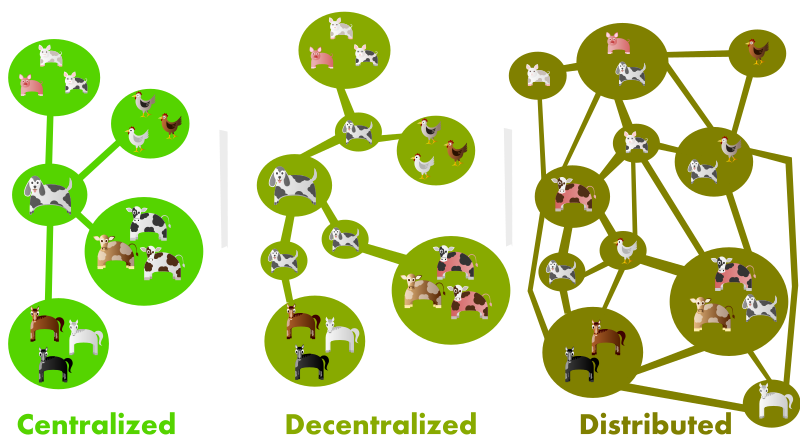 In the first diagram, of the current centralized system, if you don’t have the means to connect to the central server, then the network is worthless. Same thing with the second — the decentralized system — although it is possible your ability to connect is increased because more people are running more servers (in a federated sort of way) so it is possible your options for access are greater. I think the Distributed Web, as Stephen and others call it, may offer greater possibilities for more people in need of access. 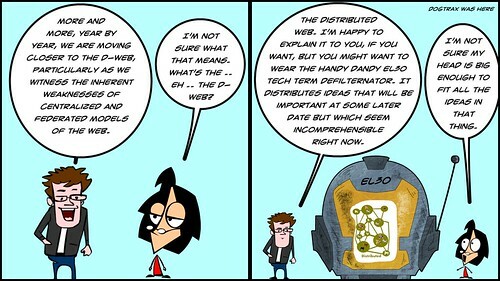 Is the Dweb more equitable in this regard, on a global scale? Maybe, I think, and here is why, based on how I am beginning to understand how the Dweb works (with the caveat that this is relatively new to me). This doesn’t solve the problem of machines and devices or interface systems into hands of those users, but the Dweb seems to be concerned less with the high-powered, huge-memory computers, since we will all be sharing resources together. I might have an inexpensive device and it won’t matter, because others elsewhere will have the computing resources that I can tap into. Of course, this is all speculative. I can envision ways this goes off the rails — around issues of privacy, of data breaches, of insecure connections, of monetizing the computing power. But I am optimistic, as I listen to Stephen and read about others, that there is a path towards something better. How we get there — and how we make sure everyone comes along, regardless of culture or race or socioeconomics — is still a question, and I am appreciative that EL3o is pushing my thinking forward, while still remembering the mistakes of the past. In exploring different resources, I came across this document from the p2pforever site — which seeks to collaboratively document examples and resources around Dweb architecture. It is a sort of manifesto of sorts, or some guiding principles, and this thinking seems to resonate with my thinking on equity and access issues. A web based on protocols, not platforms, is a safe web. Don’t put data in silos but have various platforms use the same protocols to interact. To speak in blunt and political terms: nobody cares f*ck all for the needs of rural users. We are too diffuse for mesh networks. Too many trees. Too much institutional bad karma where there should be cooperation and solidarity. How in hell can we reach the folks in the flyovers (my state of Kentucky being one), if we cannot meet with them on equal terms? By that I mean something as simple as useable upload speeds. Perhaps what we need to do is figure out how to have these conversations without the damned internet. That’s a radical idea: if the new is non-inclusive then abandon the net. I don’t have faith in any community that, distributed or otherwise, silently disempowers some who seek solidarity. I barely have enough signal to be called that. Mine is more a background scratchiness like listening to a radio by scratching a cat’s whisker across a crystal. I am lucky to be connected by that thread to folk like you who are way more like that distributed future we all hear about out here in the damned precarity. Letcher is probably three hours away from me as crow flies in the hollar. Leverett is about 30 minutes, as the deer run. It seems to me that this is an issue of rethinking the purposes of the connections. Are they to form a community (as in the case of Dwebs) or are they to come to a central place? Like you, I am a teacher and so I think about students and their families. And I think that learning is an inherently decentralized process often interrupted or impeded by centralized structures. I started pointing to the potential of the Internet in the late 1990s and immediately had many people saying “the people you’re trying to help with tutor/mentor programs don’t yet have access to these conversations”. My answer was yes, I know. That’s why my message is aimed at those who do have access, and wealth and power. How can we motivate them to care more about those without access, who live in poverty, and lack of opportunities? How can we increase that number so more are willing to spend more than tiny amounts of time, talent and dollars, and political will, to make this access more available to all? I still feel that way, but find too few listening, or too few who share the same feeling, actively connecting and learning from each other the way you, Terry and others in #clmooc have been doing.